Originally written by Mike Meier, and first published in 1991, the Training Manual has sold more than thirteen thousand copies. Following the release of the greatly expanded seventh edition in 2004, Paragliding – A Pilot’s Training Manual has become the complete resource of choice for both new students of paragliding and experienced pilots looking to expand their knowledge and understanding of this dynamic sport. 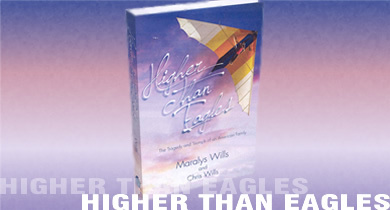 The book covers all of the basic essentials of aerodynamics and principles of flight, along with pilot techniques from the beginner through expert level. The focus is on presenting technical subject matter in a manner that is easy for the average pilot to comprehend without the need for complex theory or equations. While the Training Manual has been updated over the years to reflect changes in the sport, the 7th edition represented a major expansion in the scope and content of the manual. 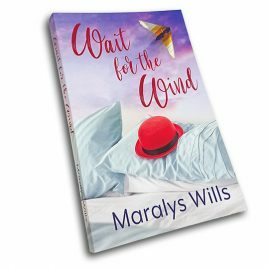 Wills Wing brought onboard paraglider pilots Mark Stucky and Tim Meehan to create a complete revision with an entirely new look, additional subject matter and new illustrations. The 8th edition has been further enhanced, especially the DVD. Newly covered subjects include specialized soaring topics such as convergence, dynamic, and microlift soaring techniques; speed-to-fly theory, and soarcasting. New chapters now cover towing, competition basics, and an introduction to paramotoring. The focus is on presenting technical subject matter in a manner that is easy for the average pilot to comprehend without the need for complex theory or equations. 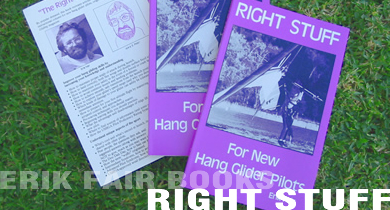 The companion DVD allows the pilot to see the specific techniques described in the manual actually being demonstrated, and to review the demonstrations as often as desired to enhance the learning process. The introductory section of the DVD is also a great way to introduce your friends and family to the great sport of paragliding. Mike Masterson, paragliding instructor – West Coast Paragliding Brilliant!! The DVD works as a great companion to the book. Full of entertaining scenes and valuable info. Showed plenty of footage of how to do things right and some dramatic footage of when things go wrong. The book presents the technical info in a progressive and organized manner that is not geeky, boring or intimidating. I bought 5 of them to see if students like the book and DVD as much as I do.In the past, I have given students training books and said: don’t read this part, ignore this, this is wrong, don’t worry about this. Not with this book and DVD. It will inspire the student to get with their instructor and practice all the things they read and watched. It doesn’t pull any punches on the potential danger of the sport. The DVD even shows that famous crash footage of a pilot launching in high winds, jamming the speed bar, getting a violent and huge asymmetric with 180 rotation and surge to impact, plus the footage of the time that the pilot had the huge asymmetric, near stall, then massive surge where he was slung over the top of the wing and flew on. This book is how a training manual should be… Full of information, not boring and not an insult to instructors. Jerry Starbuck – USHPA Certified Instructor – Blue Ridge Paragliding, Inc. 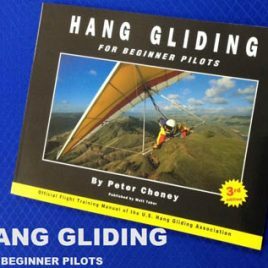 I just wanted to let you know that we now include your book, “Paragliding: A Pilot’s Training Manual” as part of our standard PPG training program. It is such a great book, we decided that every new student should have one.